Help Iram Manzoor Fight Brain Tumor. 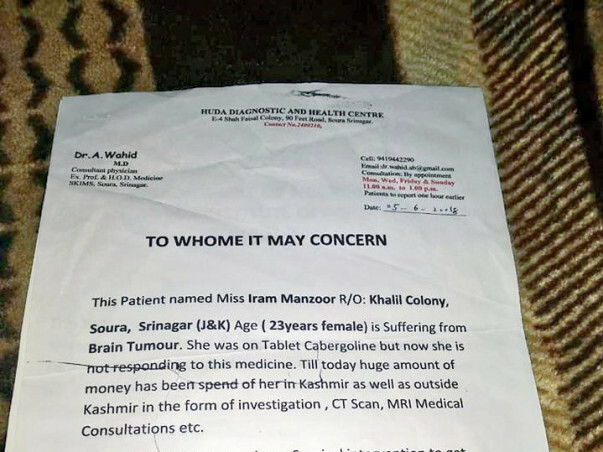 This patient namely Iram Manzoor D/O Manzoor Ahmad Kanji R/O Khalil colony soura, Srinagar J&K age (23 years old) is suffering from Brain tumor. She was on Tablet Cabergoline but now she is not responding to this medicine. 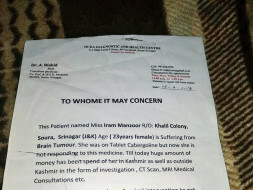 Till today huge amount of money has been spend of her in Kashmir as well as outside Kashmir in the form of Investigation, CT Scan, MRI Medical Consultations etc. Now she has to undergo Surgical intervention to get cured that cost her around 11 lac 55000 ( Eleven lac fifty five thousand rupees. This is life consuming disease. She has to undergo Surgical intervention to get cured that cost her around 11 lac 55000, This is life consuming diseases.